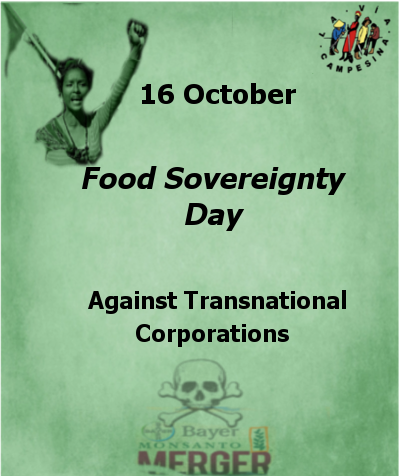 (Harare, October 13, 2016) On October 16th, La Via Campesina’s International Day of Action for Peoples’ Food Sovereignty and against transnational corporations (TNCs), we continue the struggle to end corporate control of our food and reject free trade agreements. Through their extensive and clandestine lobbying, TNCs have put in place legal, economic and trade policy frameworks to legitimise their greed for profits and destruction of nature. For example, the Investment Court System (ICS) or State Dispute Settlement (ISDS) and the Free Trade Agreements (such as in the Trans-Atlantic Trade and Investment Partnership [TTIP], Comprehensive Economic and Trade Agreements [CETA], North American Free Trade Agreement [NAFTA], Trans Pacific Partnership [TPP], Regional Comprehensive Economic Partnership [RCEP]) are all biased in their favour to ensure full control of the world agricultural production and distribution. Patents and intellectual property regimes are their tools to achieve this. In this process, peasant seeds, the foundation of agriculture, are rendered illegal. Biodiversity is eroded and replaced by uniform crops. Grabbing of land from peasants, particularly in developing countries, is carried out in the pretext of “feeding 9 billion people by 2050” through their advanced and destructive technologies. However, the peoples of the world are fighting back to roll back corporate capture, occupying lands, growing their own seeds and fighting at international level as well. At the UN, La Via Campesina and its allies continue to struggle for the adoption of the UN Declaration on the rights of peasants and other people working in rural areas to ensure recognition and protection for the very group which contribute greatly to the realisation of right to food sovereignty around the world. A binding treaty to push back the power of TNCs and hold them accountable for the crimes they commit is a necessary next step. From 12 to 16 October 2016, an International Monsanto Tribunal in The Hague, Netherlands will be held alongside the People’s Assembly to hear and evaluate cases against Monsanto and other companies and determine criminal liability. Since 2015, we have witnessed unprecedented levels of consolidations by the few agri-food corporations in the form of mergers and acquisitions such as Monsanto-Bayer, Dow-DuPont, ChemChina-Syngenta, Agrium Inc. and Potash Corp. With these consolidations, merely four corporations will control over two-thirds of the world’s supply of agricultural inputs, giving them the ability to hold the world agriculture at ransom for profits. Hunger and poverty will worsen as these corporations which earn big profits through secrecy, narrow food diversity and impunity tighten their control over sovereign state agricultural policies. Peasants produce over 70% of the food consumed globally.